Coutts & al. against Erskine. Mackenzie against M. of Powis & al. And likewise, the Answer of Robert Garden, to the same Appeal. Service on Wood's Clerk in Court to be good. A Petition of Robert Moore Esquire and others, was presented, and read; setting forth, "That Henry Byam Wood, One of the Respondents to the Petitioners Appeal, has not put in his Answer thereunto, though they have served his Clerk in Court with the Order for that Purpose, not being able to find any Place of Abode of the said Wood;" and praying, "That a peremptory Day may be appointed, for him to answer." Ordered, That the said Henry Byam Wood do put in his Answer to the said Appeal on or before this Day Sevennight; and that the Service of this Order on his Clerk in Court be deemed good Service. Sir D. Lever against Andrews. A Petition of John Andrews Gentleman, Respondent to the Appeal of Sir Darcy Lever Knight, was presented, and read; praying, "In regard his Solicitor Mr. George Wilson had lately the Misfortune to dislocate his Ancle-bone, and so not at present able to assist the Petitioner; that the hearing the said Appeal may be adjourned for a Fortnight, or such other Time as the House shall think fit." Ordered, That the hearing the said Cause be adjourned to Friday the 3d Day of March next. D. of Kingston takes the Oaths. Evelyn Duke of Kingston, at the Table, took the Oaths, and made and subscribed the Declaration, and also took and subscribed the Oath of Abjuration, pursuant to the Statutes. The House being moved, "That a Day may be appointed, for hearing the Cause wherein George Mackenzie Esquire is Appellant, and William Marquis of Powis and Robert Garaen Gentleman are Respondents:"
It is Ordered, That this House will hear the said Cause, by Counsel, at the Bar, on Friday the 24th Day of this Instant February. 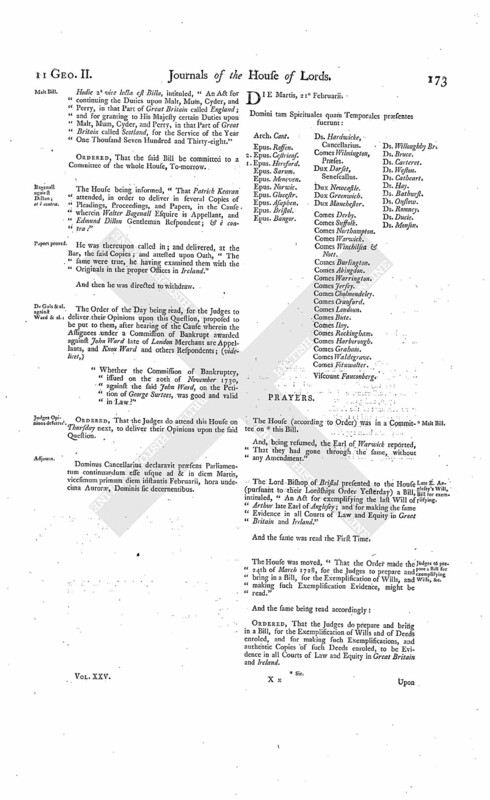 Keague to enter into Recognizance for the E. of Westmeath. The House being moved, "That Francis Keague Gentleman may be permitted to enter into a Recognizance for Thomas Earl of Westmeath, on account of his Appeal depending in this House; he being in Ireland:"
It is Ordered, That the said Francis Keague may enter into a Recognizance for the Appellant as desired. Dominus Cancellarius declaravit præsens Parliamentum continuandum esse usque ad et in diem Jovis, decimum sextum diem instantis Februarii, hora undecima Auroræ, Dominis sic decernentibus. De Gols & al. against Jones. The Answer of Philip Jones, One of the Respondents to the Appeal of Conrade de Gols Esquire and John Read, Assignees of the Estate and Effects of John Ward, under a Commission of Bankrupt awarded against him, was brought in. E. Burlington et al. Pet. referred to Judges. It is Ordered, That the Consideration of the said Petition be, and is hereby, referred to Mr. Justice Denton and Mr. Justice Comyns; with the usual Directions, according to the Standing Order. Percival to enter into Recognizance for Burke. The House being moved, "That John Percival Gentleman may be permitted to enter into a Recognizance for Gerald Burke Esquire, on account of his Appeal depending in this House; he being in Ireland:"
It is Ordered, That the said John Percival may enter into a Recognizance for the Appellant, as desired. Hodie 1a vice lecta est Billa, intituled, "An Act for vesting divers Lands and Hereditaments, in the Counties of Kent, Suffolk, Essex, Hereford, and Monmouth, and the City of London, entailed by the Will of Elizabeth late Dutchess of Bedford, in John Duke of Bedford, in Fee Simple; and for settling other Estates, in the Counties of Bucks and Hertford, of greater Value, to the like Uses, in Lieu thereof." Comyns & al. Pet. referred to Judges. It is Ordered, That the Consideration of the said Petition be, and is hereby, referred to the Lord Chief Baron of the Court of Exchequer and Mr. Justice Commyns; with the usual Directions, according to the Standing Order. De Gols et al. against Ward et al. 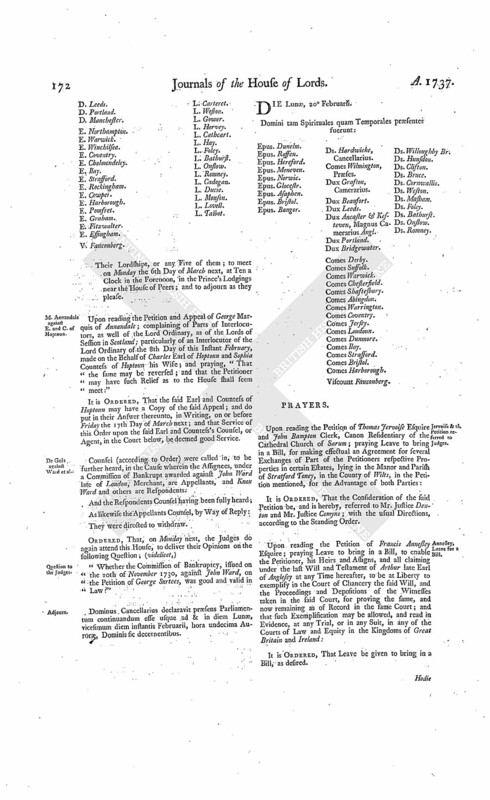 Counsel (according to Order) were called in, to be heard, in the Cause wherein Conrade De Gols Esquire and John Read Gentleman, Assignees under a Commission of Bankrupt awarded against John Ward late of London Merchant, are Appellants, and Knox Ward Clarencieux King at Arms and Elizabeth his Wife and others Respondents. Ordered, That the further Hearing of the said Cause be adjourned till To-morrow; and that the Judges do attend this House, at the said further Hearing. Dominus Cancellarius declaravit præsens Parliamentum continuandum esse usque ad & in Diem Veneris, decimum septimum diem instantis Februarii, hora undecima Auroræ, Dominis sic decernentibus. 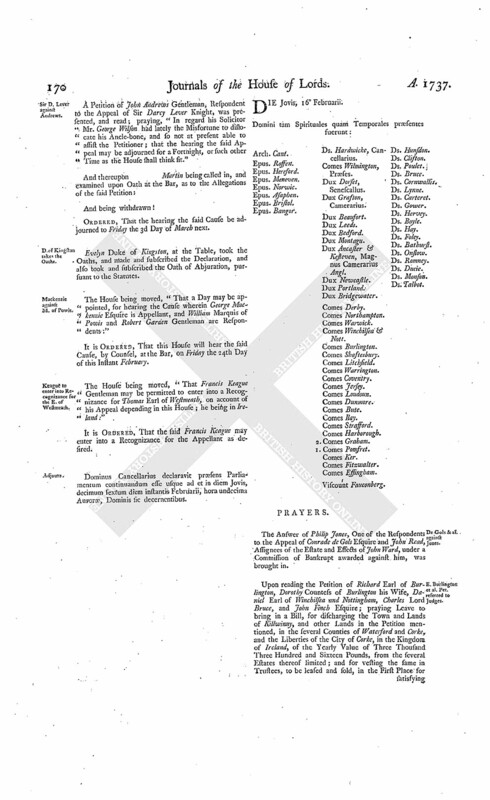 With a Bill, intituled, "An Act for continuing the Duties upon Malt, Mum, Cyder, and Perry, in that Part of Great Britain called England; and for granting to His Majesty certain Duties upon Malt, Mum, Cyder, and Perry, in that Part of Great Britain called Scotland, for the Service of the Year One Thousand Seven Hundred and Thirty-eight;" to which they defire the Concurrence of this House. Hodie 2a vice lecta est Billa, intituled, "An Act for vesting divers Lands and Hereditaments, in the Counties of Kent, Suffolk, Essex, Hereford, and Monmouth, and the City of London, entailed by the Will of Elizabeth late Dutchess of Bedford, in John Duke of Bedford, in Fee Simple; and for settling other Estates, in the Counties of Bucks and Hertford, of greater Value, to the like Uses, in Lieu thereof." L. B. Glocester. Ld. Delawarr. Their Lordships, or any Five of them; to meet on Monday the 6th Day of March next, at Ten a Clock in the Forenoon, in the Prince's Lodgings near the House of Peers; and to adjourn as they please. M. Annandale against E. and C. of Hoptoun. 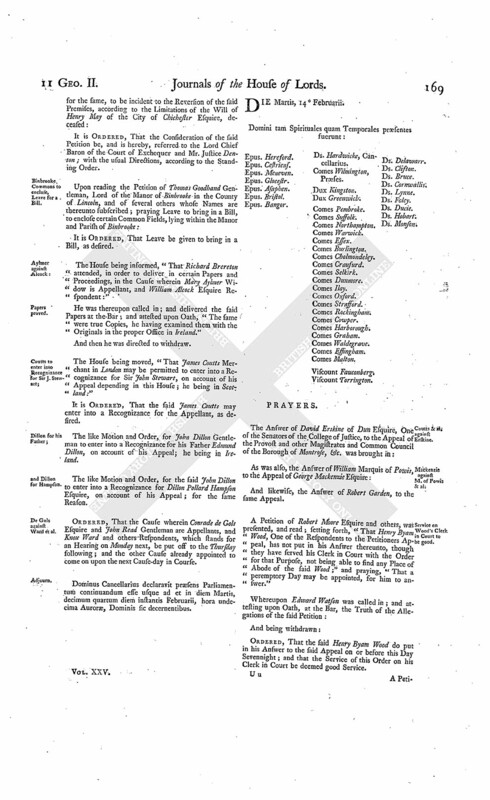 Upon reading the Petition and Appeal of George Marquis of Annandale; complaining of Parts of Interlocutors, as well of the Lord Ordinary, as of the Lords of Session in Scotland; particularly of an Interlocutor of the Lord Ordinary of the 8th Day of this Instant February, made on the Behalf of Charles Earl of Hoptoun and Sophia Countess of Hoptoun his Wife; and praying, "That the same may be reversed; and that the Petitioner may have such Relief as to the House shall seem meet:"
It is Ordered, That the said Earl and Countess of Hoptoun may have a Copy of the said Appeal; and do put in their Answer thereunto, in Writing, on or before Friday the 17th Day of March next; and that Service of this Order upon the said Earl and Countess's Counsel, or Agent, in the Court below, be deemed good Service. Counsel (according to Order) were called in, to be further heard, in the Cause wherein the Assignees, under a Commission of Bankrupt awarded against John Ward late of London, Merchant, are Appellants, and Knox Ward and others are Respondents. "Whether the Commission of Bankruptcy, issued on the 20th of November 1730, against John Ward, on the Petition of George Surtees, was good and valid in Law?" Dominus Cancellarius declaravit præsens Parliamentum continuandum esse usque ad & in diem Lunæ, vicesimum diem instantis Februarii, hora undecima Auroræ, Dominis sic decernentibus. Jervoise & al. Petition referred to Judges. Annesley, Leave for a Bill. Hodie 2a vice lecta est Billa, intituled, "An Act for continuing the Duties upon Malt, Mum, Cyder, and Perry, in that Part of Great Britain called England; and for granting to His Majesty certain Duties upon Malt, Mum, Cyder, and Perry, in that Part of Great Britain called Scotland, for the Service of the Year One Thousand Seven Hundred and Thirty-eight." Bagenall against Dillon; et è contra. 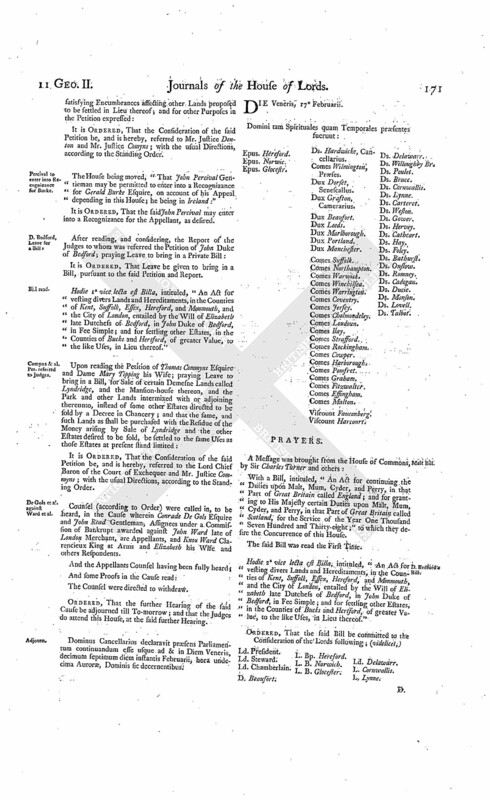 The House being informed, "That Patrick Kearan attended, in order to deliver in several Copies of Pleadings, Proceedings, and Papers, in the Cause wherein Walter Bagenall Esquire is Appellant, and Edmund Dillon Gentleman Respondent; & è contra:"
"Whether the Commission of Bankruptcy, issued on the 20th of November 1730, against the said John Ward, on the Petition of George Surtees, was good and valid in Law?" Ordered, That the Judges do attend this House on Thursday next, to deliver their Opinions upon the said Question. Dominus Cancellarius declaravit præsens Parliamentum continuandum esse usque ad & in diem Martis, vicesimum primum diem instantis Februarii, hora undecima Auroræ, Dominis sic decernentibus.